Yes. 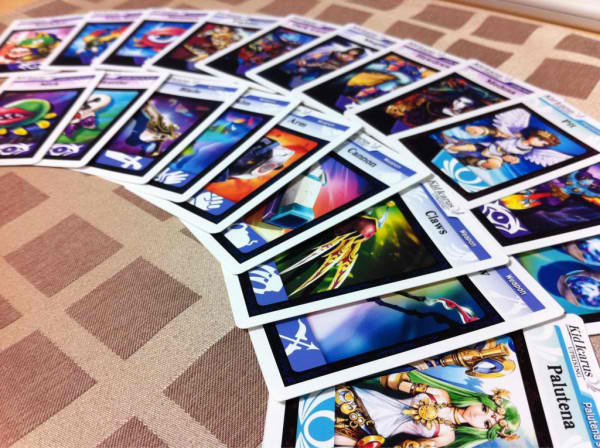 It appears that the Kid Icarus: Uprising AR cards are pre-determined. I call this rigged, since I would always pick the winning card if I were to face another player on the playground. If I ever went on a playground. Sadly, they don’t have playgrounds in college, really, so I miss out on that experience. What I say was confirmed by a Nintendo representative during a quick demonstration of the cards. No matter how many times you try to defeat Palutena with Pit, you will lose. You will also lose against Magnus, and it’s making me wonder if Pit needs a little more practice. There’s no way he can defeat Medusa if he’s constantly losing to the same people. I am disappointed at this. I was hoping to see some real gameplay with these AR cards, and now all I can hope for is some pretty battle that I can’t even control. Where’s the fun in that? The cards are definitely something to look at, and I’m sure the visuals for the battles will be awesome. Every time I look at screenshots for the game, I drool at the graphics. To me, it’s a beautiful handheld game. But if all I can do is watch Pit lose the same battles over and over again on these AR cards, what’s the point? If I can shoot at a dragon, why can’t I shoot arrows at Palutena? What do you think? I’m sure I’m not the only one who doesn’t want to battle with Pit in my imaginary playground.